These plant-sucking pests are a familiar problem in greenhouses, in gardens, and on indoor plants. Here’s how to control mealybugs naturally with beneficial insects, insecticidal soaps, and other natural techniques. 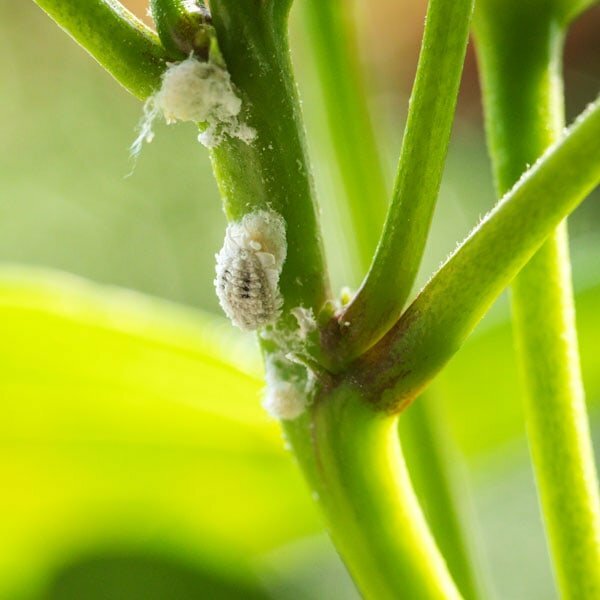 Found in warmer growing climates, mealybugs are soft-bodied, wingless insects that often appear as white cottony masses on the leaves, stems and fruit of plants. They feed by inserting long sucking mouthparts, called stylets, into plants and drawing sap out of the tissue. Damage is not often significant at low pest levels. However, at higher numbers they can cause leaf yellowing and curling as the plant weakens. Feeding is usually accompanied by honeydew, which makes the plant sticky and encourages the growth of sooty moulds. Mealybugs are a common greenhouse pest that affect ornamentals, houseplants, avocados and fruits. Adults (1/10 — 1/4 inch long) are soft, oval distinctly segmented insects that are usually covered with a white or gray mealy wax. Small nymphs, called crawlers, are light yellow and free of wax. They are active early on, but move little once a suitable feeding site is found. Note: There are approximately 275 species of mealybugs known to occur throughout the United States. Adult females deposit 300-600 eggs within an excreted, compact, waxy cottony-appearing mass mostly found on the underside of leaves (these egg cases can be confused with downy mildew). Egg laying is continues for about 2 weeks with the female dying shortly after all eggs are laid. Hatching occurs within 1-3 weeks and the small active yellow nymphs begin migrating over the plant in search of feeding sites on which to settle. As they feed, they secrete honeydew and a waxy coating begins to form over their bodies. Female nymphs pass through three stages (instars) with a generation taking as little as one month, depending on temperature. Male nymphs pass through five instars. They do not feed after the first two instars and exist solely to fertilize the females. In the greenhouse, continuous and overlapping generations occur throughout the year. There is little winter survival outside of greenhouses in the North. Prune out light infestations or dab insects with a Q-tip dipped in rubbing alcohol. Do not over water or overfertilize — mealybugs are attracted to plants with high nitrogen levels and soft growth. Commercially available beneficial insects, such as ladybugs, lacewing and the Mealybug Destroyer (Cryptolaemus montrouzieri), are important natural predators of this pest. Use the Bug Blaster to hose off plants with a strong stream of water and reduce pest numbers. Washing foliage regularly with a leaf shine — made from neem oil — will help discourage future infestations. Safer® Insecticidal Soap will work fast on heavy infestations. A short-lived natural pesticide, it works by damaging the outer layer of soft-bodied insect pests, causing dehydration and death within hours. Apply 2.5 oz/ gallon of water when insects are present, repeat every 7-10 day as needed. Neem oil disrupts the growth and development of pest insects and has repellent and antifeedant properties. Best of all, it’s non-toxic to honey bees and many other beneficial insects. Mix 1 oz/ gallon of water and spray every 7-14 days, as needed. Washing foliage regularly with a leaf shine will help discourage future infestations. Tip: Control ants when releasing beneficial insects. Ants feed on the honeydew that mealybugs produce and protect the bugs from predators to ensure this food supply.